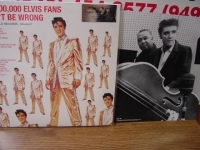 "Elvis Presley, 50 Million Fans (limited stock)"
Simply Vinyl 180 Gram Limited Edition Analog Virgin Vinyl. Posed in one of the best of the Elvis suits, it's a great cover art piece to a great album defining some of Elvis' best pre-Army songs. This 1959 collection captures the King at his rock & roll best, spotlighting the hits he recorded right before entering the Army. Elvis never rocked any harder or better than he did on tracks like "A Big Hunk of Love" and "I Need Your Love Tonight", and the single "(Now and Then) There's A Fool Such as I", which seemingly merged every musical style he'd ever attempted into one two-and-a-half minute masterpiece, as well as a great romantic ballad, "My Wish Came True".